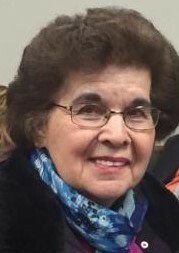 It is with great sadness that we announce the passing of our mother Emilia Gloria Hoffman on May 21 2018. She was 84 years old. Emilia is survived by her brother Paul (Linda) Shwaylyk, and 4 daughters Shiela (Rodney) Allen, Gaile (Jim) Siddons, Laurie (Randy) Saal and April (Ray) Jones and 8 grand children and 8 great grand children. Dear Sheila,Gail,Laurie April and families, I’m so sorry for the loss of your dear mum. I remember Millie with great fondness for the babysitting and great lunches she provided after service in my early days. We are very sorry for your loss. I enjoyed very much the time I spent with Milly looking after her eye care and her talking about the Truth and the friends that it brought. She was a wonderful sister. Our thoughts are with you. Dear Sheila, Gaile, Laurie and April. My deepest condolences in the loss of your mom.